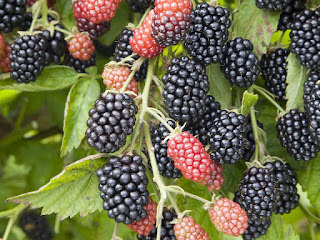 A couple of weeks ago, I bemoaned the fact that I could not find any blackberries anymore. Thankfully there were a lot of suggestions about where I could find some, and a couple of phone calls from family friends who had some on their property. So, the last two weekends, we went berry picking. Last Saturday, we took all four girls to a friend’s house who has acres and acres of land behind his house with trails running through it all. Along most of those trails, there were blackberry bushes burgeoning with the tasty treats. Of course, the kids complained that the thorns were too much for them. Meanwhile, Wendy and I pushed the thorns aside and made our way into the thickest part of the brambles. That’s where the best berries are often found. To be fair to the girls, they all did some picking. Patience probably helped the most, right along with IdaLena. IdaLena at one point balanced on a fallen, rotten tree trunk to get some choice berries that were pretty far above her head. As for the little two, they ran around and kept themselves entertained. They did pick some berries, but weren’t really into it. At the end of a couple hours in the fields, we came home with about nine quarts of berries. Almost immediately, they went into jam and a very tasty pie. The rest went into half pints and pints for blackberry jam. Wendy talks about making jam and pie….. The first thing I did after gently washing the berries (leaves and a bit of dirt often get stuck to those little jems) was to measure out six cups for a pie. I put them in a glass bowl in the fridge. I can get around the kitchen pretty well, but even so, making jam and pie at the same time is too much a task to even attempt. Jam takes longer, makes more of a mess, requires more equipment, and demands more attention so it made sense to tackle that task first thing in the morning. We had quite a haul so there were enough berries to make a triple batch. Mom always said “only make jam in single batches, otherwise it won’t set right”. Well… let’s just say I like to prove people wrong. I was hesitant, though. In recent years, I have had some less than successful attempts at jam making. Last year’s strawberry jam was quite thin--my helper, aka 13 year old daughter, was impatient and I gave in too early. Weighing the possible shortcomings against the daunting task of making three separate batches, my desire to leave the kitchen before midnight won over so I gave it a shot. Thankfully, it worked! I used my big canning pot and mixed all the berries with the required sugar. None of my finickey family likes “chunks” in their food, so after the sugar dissolved I used the immersion blender (one of my favorite unintentional purchases) to smooth out the mixture. After that, it’s really a matter of stirring, and not getting burned. If you’ve never made jam before, you should be warned, there is a significant splatter factor. Although licking the splatter off one,s arm is a tasty solution, those bad boys are HOT! Of course there is also a matter of preparation. Once I had an idea of how much jam we would have in the end, I gathered my jars so that the dishwasher could run while the jam cooked, generally, it’s best if they finish about the same time. Hot jam, hot jars, hot lids and all the other supplies set up and ready to go makes the whole process go a bit more smoothly. Again, if you’re new to jam making, a candy thermometer is very helpful. Simply cook, stirring frequently until it reaches the jell point or 220o F. This takes a while. As I indicated earlier, you do not want to rush this. If my memory serves me, it took about 40 minutes for the this year’s strawberry jam and about 30 minutes for the blackberry. If the jam doesn’t cook long enough, it will be thin, runny, and the sugar separates out a bit. It’s still tasty, but not really what you want from your jam. Likewise, don’t let yourself get distracted, or err by cooking too long. Jam unstirred for too long will stick to the pot and burn. Jam overcooked won’t spread well and can become almost candy like. So, stir frequently and use that thermometer! Of course if you don’t have a thermometer, there are several other ways to test the jelling of your jam. The sheet and spoon test are both described quite well in the Ball Blue Book (I’m not sure why, but I have 3 different editions of this). It’s work, I’d even say it qualifies as manual labor--on your feet, in a hot kitchen, stirring, lifting--but the end result is so worth it! 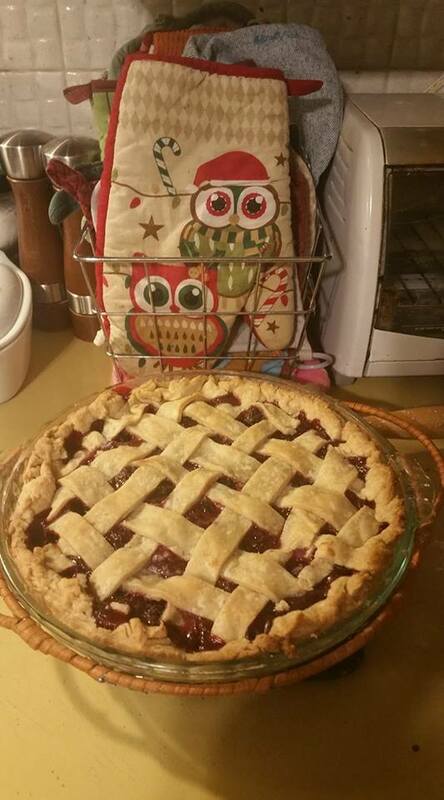 I waited another two days before making that pie. I had not intended to wait, but some things came up, life had other plans for me. My youngest two girls are great at making pie dough so if they are home, it becomes an event of sorts--a messy one at that. We are trying to do things a bit more healthy these days, so I opted to make the dough with ½ all purpose flour and ½ whole wheat. Ssshhhh don’t tell Craig, I don’t think he even noticed. The filling recipe is easy too--berries, sugar, flour, cinnamon, and butter. We have it on an index card which means I copied it from someone. I assume it can from Old Granny’s kitchen (Craig’s Grandmother) but whether it’s originally from Betty Crocker (like my crust recipe) or another source, I’m sure I will never remember. 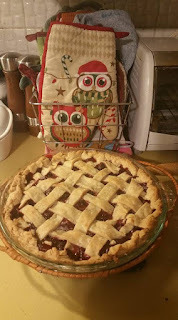 I decided to get a little fancy too, making the top crust but cutting thin slices and weaving them into a criss-cross pattern. I must say, it looked good, almost as good as it tasted. On a side note, the next day, we used some of the extra dough the girls made to make homemade pastries only because they were fighting over the last of the Pop-Tarts (which I try not to buy). We rolled out the dough, broke up some pieces of chocolate bar, alternating with mini marshmallows, folded the top over, crimp the edges, baked, and…... voila better than store bought. Not nearly as good as the fresh blackberry pie, but the kids liked them, silly girls. We went back out this week, brought some friends to come along. We only had the two younger girls with us, while the twins were at a church picnic with their friend. Their three kids and our little two went off on their own with the visiting grandmother while the four parents went picking. We didn’t get nearly as many as last week, and it looks like others have been out there, but we had fun talking to our new friends. That was most of the fun in picking this week. I guess we came home with about 4 quarts of berries this time. I’m hoping that maybe we can freeze the berries so we can make a blackberry pie at Thanksgiving or Christmas. (If we get enough, maybe we’ll freeze enough for a pie for each of those holidays.) Hopefully we’ll still have enough for some fresh eating, too, although we generally get a good snack while picking. There’s nothing quite as sweet as a berry you’ve picked yourself directly off the bush. We might get one more weekend of picking. I certainly hope so. I am dreaming about a blackberry pie in the darkest days of winter. It will be like a slice of summer amid the stark monochromatic days of December. Plus, we have jam for our toast in the winter. It is oh, so good. We did both blackberry and black raspberry jams and lots of strawberry jam. We are well set for great breakfasts all winter. I want to thank our friends who allowed us to trapse all over their lands. They shall remain nameless to protect their property, but they do read our blog. We are ever grateful for their generosity. And now to get those berries into my belly. Craig Bacon has been berry good this week. He was rewarded with a pie. Wendy Bacon is back at the canning thing while Craig finishes this piece. This time, it’s sweet and sour mustard with some of the peppers from our garden.